Pope Benedict XVI has told pilgrims at the Vatican that his remarks on Islam which angered Muslims around the world had been "misunderstood". He expressed his "deep respect" for Islam during his weekly audience. He said his use of medieval quotes from a 14th-Century Byzantine emperor, which were critical of Islam, did not reflect his own convictions. He said he hoped his recent speech in Germany could lead to a "self-critical dialogue" among faiths and cultures. "I included a quotation on the relationship between the religion and violence. This quotation unfortunately was misunderstood. In no way did I wish to make my own the words of some medieval emperor," he told thousands of faithful. "I wish to explain that not religion and violence, but that religion and reason, go together. I hope that my profound respect for world religions and for Muslims who worship the one God and which help to promote peace, liberties, justice and moral values for the benefit of all humanity is clear. "I trust that after the initial reaction, my words at the university of Regensburg can constitute an impulse and encouragement toward positive, even self-critical dialogue both among religions and between modern reason and Christian faith," he added. The Pope is eating humble pie before the world, says the BBC's David Willey in Rome. 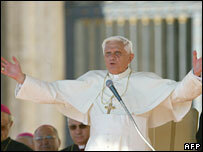 How can a person in a such a powerful position as the Pope make such a blunder? On Sunday, Benedict said he was "deeply sorry" for the reaction in some countries to his speech last week in Germany. But on Wednesday, he did not retract words uttered during his six-day trip to Bavaria as demanded by his Muslim critics, our correspondent says. He says it remains to be seen whether his latest remarks are going to be accepted by his Muslim critics. The Pope has faced calls from Muslims for an unequivocal apology, but has so far only said he regrets the offence his words caused. In the speech in Germany, he quoted medieval Byzantine emperor Manuel II Paleologos criticising some teachings of the Prophet Mohammed as "evil and inhuman". The speech sparked several days of protests in Muslim countries.